Known for his focus on contemporary subjects, French Impressionist Edgar Degas first began to depict horses in the 1860s. The increasing popularity of racing in Europe matched with Degas' interest in the subject as an avid spectator helped to advance equestrian themes into the forefront of his oeuvre. 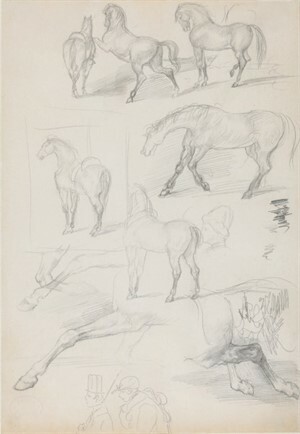 This delightful work - Étude pour Chevaux de Pur Sang - underscores Degas' level of confidence with the subject and his advanced understanding of horse musculature, particularly in the more elaborate studies showing the horses' legs in motion. Degas' thoughtfully composed lines infuse this study with a sense of strength and energy, and reflect Degas' keen observation of this contemporary subject. The equestrian theme remained one of Degas' primary interests for the next thirty years, and these compositions eventually took their place among the most popular subjects of his career. This drawing has been authenticated by both Ted Reff in 2015, and Brame and Lorenceau in 1998.